Born on June 20th in Veracruz. He was a merchant before starting night school at the Academia de San Carlos in 1928. 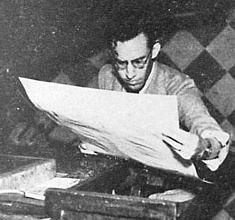 Between 1929 and 1934 he studied with Diaz de Leon at the Taller de Artes del Libro. He worked for Cultura publishing making illustrations from 1932 and until 1939. After that he taught art at various schools in Mexico City. He was a member of the Liga de Escritores y Artistas Revolucionarios LEAR and a founding member of the Taller de Grafica Popular in 1937. In 1941 he presented his first individual exhibition. He was also a founding member of the Sociedad para el Impulso de las Artes Plasticas in 1948.